To meet the support requirement of expanding user base of PFMS, Controller General of Accounts declared open Help Desk for PFMS on 26th May, 2017. Users facing operational difficulty in PFMS may kindly contact Toll Free Number 1800118111. They may also send e-Mail to helpdesk-pfms@gov.in. The Gazette of India, Extraordinary, Part I - Section 1, Publlished by Authority, Ministry of Finance (Department of Expenditure), RESOLUTION, New Delhi, the 16th May, 2017 *** No. 1-2/2016-IC .—Whereas, vide its Resolution No.1-2/2016-IC notified in the Gazette of India, dated the 25th July, 2016, the Government of India accepted the recommendations of the Seventh Central Pay Commission in respect of the ategories of employee s covered in the Terms of Reference contained in its earlier Resolution No.1/1/2013-E.III(A) dated the 28 th February, 2014. 7th Pay Commission Allowances: Union leaders set to meet official today. The 7th pay commission had recommended that of a total of 196 allowances, 52 be abolished altogether and 36 be abolished as separate identities by subsuming them in another allowance. The Cabinet had earlier approved modification in recommendations of the 7th pay commission relating to the method of revision of pension of pre-2016 pensioners and family pensioners based on recommendations of a high-level panel. The decision will benefit over 55 lakh pre-2016 civil and defence pensioners and family pensioners. 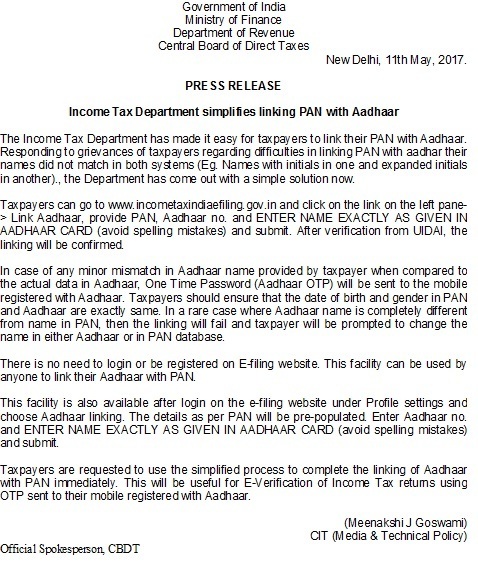 Income Tax (IT) Department simplifies linking PAN with Aadhaar - No need to login or be registered on the E-filing website***Government of India, Ministry of Finance, Department of Revenue, Central Board of Direct Taxes, New Delhi, 11-May-2017***PRESS RELEASE***INCOME TAX DEPARTMENT SIMPLIFIES LINKING PAN WITH AADHAR***Taxpayers can go to http://www.incometaxindiaefiling.gov.in and click on the link on the Left Pane ➔ Link Aadhaar, provide PAN, Aadhaar number and ENTER NAME EXACTLY AS GIVEN IN AADHAAR CARD (avoid spelling mistakes) and Submit. 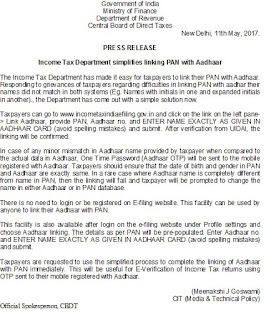 After verification from UIDAI, the linking will be confirmed. Reservation for Ex-servicemen in direct recruitment Group ‘C’ posts *** No. 11019/20/Misc./2015/MF.CGA(A)/NG/86***Government of India, Controller General of Accounts, Ministry of Finance, Department of Expenditure, Mahalekha Niyantrak Bhawan, GPO Complex, E-Block, INA, New Delhi - 110023, Dated. the 5th May, 2017***OFFICE MEMORANDUM***Reference is invited to the reservation, concessions and relaxations applicable for ex-Servicemen in Central Government Services (Group ‘C ' posts). The Government of India has been issuing instructions from time to time for filling up of vacancies under prescribed quota reserved for ex-servicemen category. 7th CPC - CCS(RP)Rules, 2016: Fixation of pay of State Government Employees on their appointment in Central Government***No.12/2/2016-Estt. (Pay -I), Government of India, Ministry of Personnel, Public Grievances and Pensions, Department of Personnel and Training***North Block, New Delhi Dated the 11th May, 2017***OFFICE MEMORANDUM***The undersigned is directed to state that the method of fixation of pay of State Government employees on their appointment under the Central Government has been spelt out in this Department’s OM No.12/ 1/94-Estt. (Pay-I) dated 24.13.1994, 3.1.1996, OM No.13 / 2 / 1999-Estt(Pay-I) dated 18.6.2001 and OM No.12/1/2009-Estt(Pay-I) dated 28.8.2014. 7th Pay Commission Allowance: Why arrears from January 2016 should be provided? 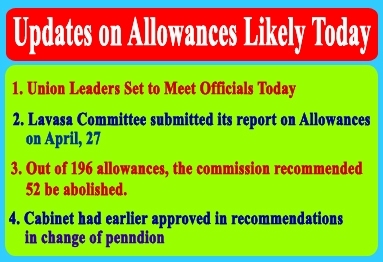 Although 15 days have been passed the Committee on Allowances' has not made its report public. 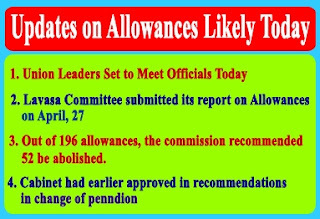 The allowance committee which examined 7th pay commission’s recommendations has suggested some modifications. The Empowered Committee of Secretaries (E-CoS) is likely to meet soon to screen the allowance committee report on 7th pay commission recommendations, an employee union leader said. He expects the Empowered Committee of Secretaries to firm up the proposal in a fortnight for approval of the Cabint. The Ashok Lavasa committee on allowances, which examined the 7th Pay Commission’s recommendations on allowances, submitted its report of the finance minister on April 27. The allowances that are applicable universally to all employees as well as certain other allowances which apply to specific employee categories, the finance ministry said in a statement. There are a few modifications that have been suggested in some allowances applicable to all central government employees and other allowances which are applicable to specific employee categories. A massive protest has been organized on may 23 by the Confederation of central government employees against the delay in implementing the allowance hike as per the revised 7th Pay Commission recommendations. The Act is applicable to all women who are employed in any capacity directly or through any agency i.e. either on Contractual as Consultant. 7th Pay Commission: Arrears on higher allowances soon says government***The government has assured that the demand for the arrears on higher allowances as per the 7th Pay Commission would be met soon. The assurance was given by the Cabinet Secretary P K Sinha after a meeting with the National Joint Council of Action or NJCA the consolidated body of employee unions. 7th Pay Commission: Some Clues Emerge On Allowance Timeline: the Empowered Committee of Secretaries (E-CoS) may take 2-3 weeks to screen the allowance committee report on 7th pay commission recommendations then proposal of Empowered Committee will be placed for approval of the Cabinet. The 7th pay commission had recommended that house rent allowance or HRA be paid at the rate of 24 per cent, 16 per cent and 8 per cent of the new basic pay, depending on the type of city. PENSIONER’S PARITY: By approving the recommendations of the Committee headed by Secretary (Pension) on 03.05.2017 on the issue of Pensioner’s Parity, the Cabinet rejected option-1 parity recommended by 7th CPC that was more beneficial to many pre-2016 pensioners. 7CPC Allowances, Minimum Wages, multiplying factor, pension parity, MACP, issues discussed in the Standing Committee Meeting of NC(JCM) on 3rd May***National Federation of Indian Railwaymen, 3, Chetmsford Road, New Delhi - 110 055, No. 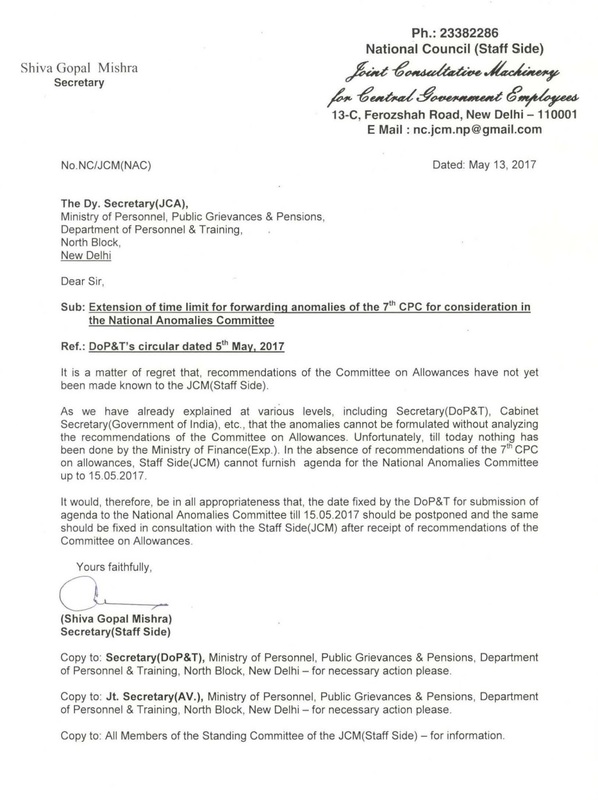 IV/NFIR/SCM/Part VII Dated 04/05/2017 *** The General Secretaries of Affilated Unions of NFIR *** Brother *** Sub: Issues discussed in the Standing Committee Meeting of NC/JCM held at Room No. 119, North Block, New Delhi on 3rd May 2017 - reg. Government of India, Ministry of Science and Technology, Department of Science and Technology, Technology Bhavan, New Mehrauli Road, New Delhi - 110 016 ** No. SM/31/02/2015 dated May 01, 2017 ** It is recommended that the Office of the Surveyor General of India may be shifted to Delhi from Dehradun subject to the condition that there will be no investment in the infrastructure and the office space will be managed within the SOI premises in Delhi. 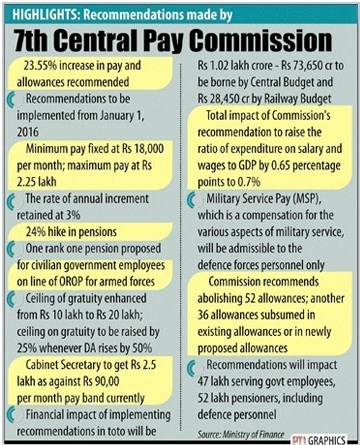 Cabinet approves modifications in the 7th CPC recommendations on pay and pensionary benefits - The Union Cabinet chaired by the Prime Minister Shri Narendra Modi approved important proposals relating to modifications in the 7th CPC (Central Pay Commission) recommendations on pay and pensionary benefits in the course of their implementation. Earlier, in June, 2016, the Cabinet had approved implementation of the recommendations with an additional financial outgo of Rs 84,933 crore for 2016-17 (including arrears for 2 months of 2015-16). Applicability of Central Civil Services (Revised Pay) Rules, 2016 to persons re-employed in Government Service after retirement and whose pay is debitable to Civil Estimates *** No.3/3/2016-Estt. (Pay II), Government of India, Ministry of Personnel, Public Grievances & Pension, Deparrtment of Personnel & Training, North Block, New Delhi Dated 01.05.2017 *** OFFICE MEMORANDUM *** Applicability of Central Civil Services (Revised Pay) Rules, 2016 to persons re-employed in Government Service after retirement and whose pay is debibable to Civil Estimates. 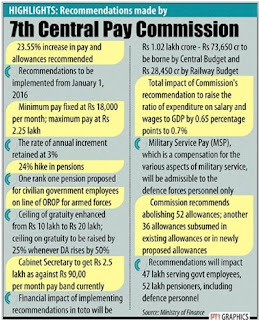 If the government accepts the bare recommendations of A K Mathur-led 7th Pay Commission then the HRA component of central government employees will increase ranging between 106 percent and 122 percent.Take, for instance, a central government employee at the very bottom of the pay scale, where the basic pay (pay of pay band + grade pay) is now Rs 7,000, would currently be entitled to an HRA of Rs 2,100 in a Class X city. As per 7th Pay Commission, the new entry level pay at this level is Rs 18,000 per month against which the new HRA for a Class X city would be Rs 4,320 per month, that is 106 percent more than the existing level. Similarly, at the highest level of the pay scale, the Cabinet Secretary and officers of the same rank have a basic pay of Rs 90,000, which means they are entitled to current HRA of Rs 27,000 in Class X towns. After the revised pay scale, the new basic pay is Rs 2.5 lakh, for which the HRA would be Rs 60,000, meaning a hike of 122 percent. 7th Pay Commission: Arrears likely to be provided on allowances, NJCA chief to meet Cabinet Secretary tomorrow***The National Joint Council of Action (NJCA) Chief Shri Shiv Gopal Mishra will meet Cabinet Secretary Shri P K Sinha on Tuesday to discuss the report submitted on allowances. Shri Mishra said that arrears on allowances would most likely be provided to the central government employees. 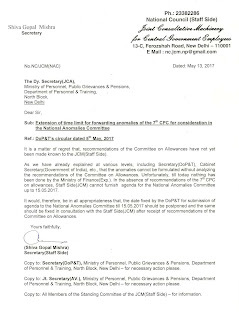 The Committee on Allowances headed by Shri Ashok Lavasa, Finance Secretary and Secretary (Expenditure) and constituted by the Ministry of Finance to examine the 7the CPC recommendations on Allowances, submitted its Report to Shri Arun Jaitely, Finance Minister on 27-04-2017. The Report, now being examined in the Department of Expenditure, will be placed before the Empowered Committee of Secretaries (E-CoS) set up to screen the 7th CPC recommendations and to firm up the proposal for approval of the Cabinet.